Sinus problems originate elsewhere, usually with overloaded lymph due to stress or poor digestion. The interventions mentioned here give relief but visit the stress, open the exits and digestive posts to address the underlying cause. 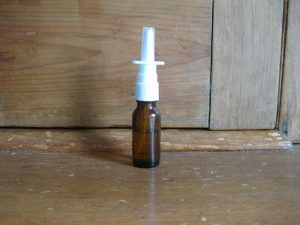 Applying Colloidal Silver (Silver Sol) topically to the respiratory mucosa via a nasal atomizer (while inhaling) reduces inflammation. A simple aide that works WITH the body in resolving inflammation is Colloidal Silver aka Silver Sol (#4274-1) which can be efficiently applied to the involved mucosa (full strength) using a nasal atomizer (or nebulizer) to relieve most “-itises”. To reach into the sinus and the bronchus inhale deeply while spritzing. Many have reported to me that they were able to keep respiratory inflammations down with regular use of Silver Sol topically. This works well for the ‘faucet nose’ condition. For stuffy conditions, use the TeiFu wick first (below). If you have been diagnosed with chronic sinusitis or bronchitis, or, have these conditions often, use the Silver/TeiFu regularly as needed to manage symptoms. Then visit the respiratory post to learn how to support these tissues with herbal remedies. Also, any kind of “-itis” is a simple irritation of specific tissue. Your body knows how to make its own anti-inflammatories and the pain page discusses that. Shake well and make new batch for each application. [Appropriate essential oils for this include Eucalyptus (#3904-9), Tea Tree (#1777-1), Lavender (#3907-8) or the combination called Guardian (#3922-9).] Salt may reduce the effectiveness of Silver so do not use together, but rather at different times. 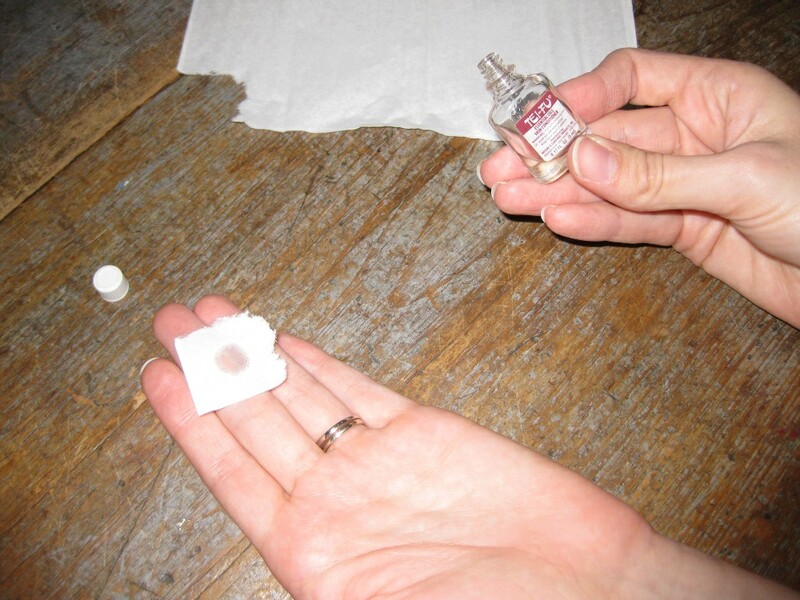 It is important to use sterile water and equipment and NO pressure when doing a saline rinse. To apply the saline solution to the sinuses, a baby syringe, or a clean rubber-topped dropper can be used. If unavailable, an ear syringe or any dropper from a pharmacy, or a neti pot (a “tea pot” for the nose) may be purchased. Another option is to use a small watering pot with a small spout that can fit into the nostril. The idea is to allow the saline solution to slowly flow into the nostril. If you use a syringe, do not use force but rather produce a slow stream into the nostril. Even though it is easy, it is awkward until you get used to it. Lower your head over a sink. Turn your neck so your left nostril is down. Keep your nose slightly higher than your mouth. Insert the solution into your right nostril. You can inhale slightly to get things moving. The solution goes in one side of nose, and out the other side – which cleans everything out in its path. The solution will drain from your left nostril into the sink. Keep blowing your nose into the sink throughout the process – you’ll feel a huge difference immediately. 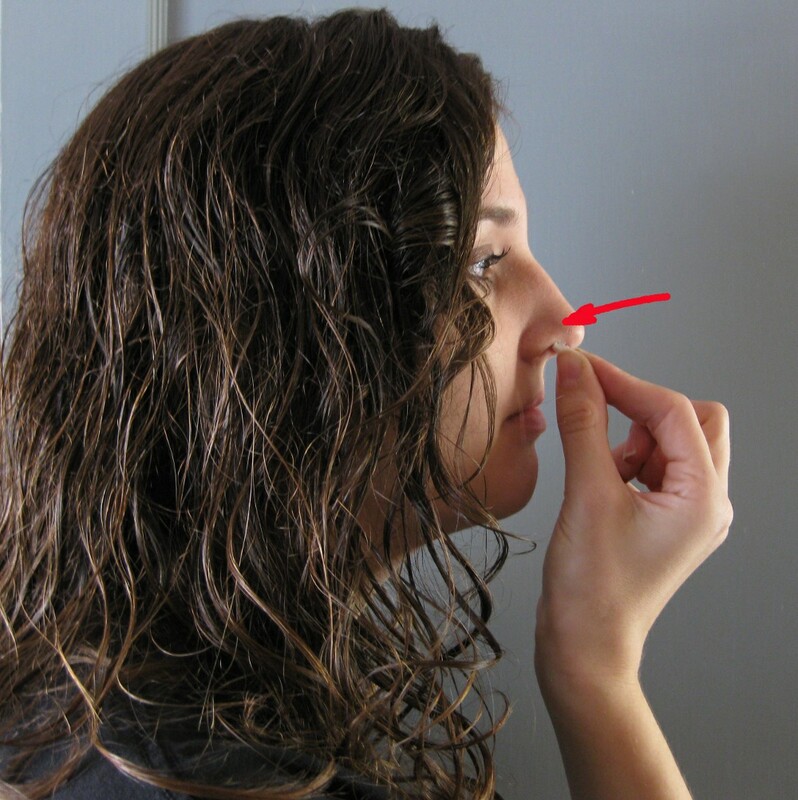 Repeat the same process for other nostril. You can gargle with some solution, letting it wash the back of your throat. To keep the solution from running into your mouth, breathe continuously through your mouth. This procedure can be done once or twice a day for mild symptoms of chronic sinusitis or for prevention during allergy season. 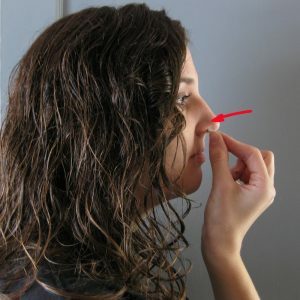 From my experience, and that of my family and clients, this is the easiest way to keep clogged sinuses open. The most effective way to use this oil for the sinuses is to make a ‘wick’ so that the essence can be applied in continual small amounts over an extended period of time. Fold so 1/3 is above and below the dot. Fold in half so dot is inside the fold then roll from the fold end so dot is in the middle of the roll. 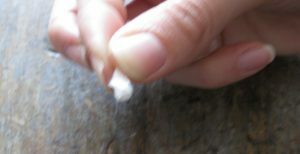 wipe the inside tip of your nose so that it is dry and so the wick will stay in place. Place this tiny (but powerful) wick in the inside of the tip of your nose (part farthest from the face) in the inside crease so that it cannot be seen. 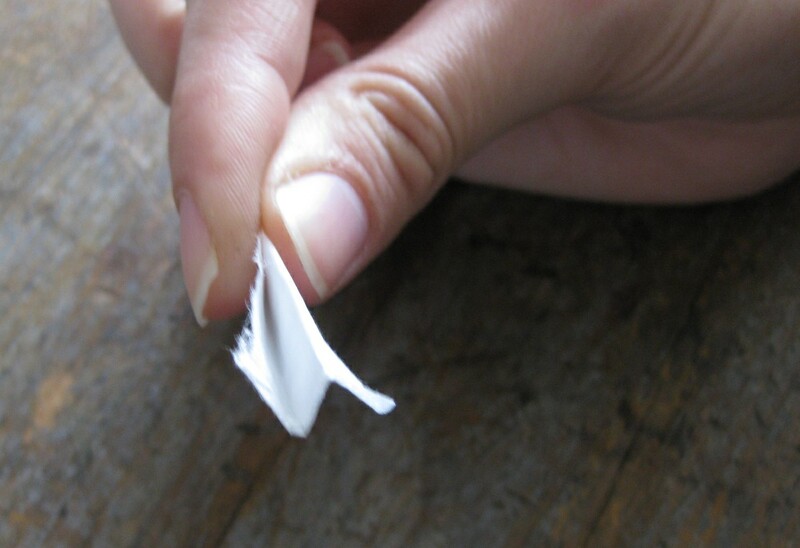 If this burns, you put too much Tei-Fu on the tissue. When placed, the air passage should not be blocked. Hide the wick in the forward pocket of the nose as indicated by the arrow. and the essential oils enhance circulation – not only in the sinus but also in the lungs. With each natural inhale, these essential oils reach the lungs. This wick can remain in place all night and for many people, reduces snoring. It is particularly useful for people who tend to get headaches in the morning or when lying down, and for a dry cough without fever. This is a quick, old-fashioned and heroic way to clear the head. In a small container like a film canister empty 1 capsule of Bayberry (#60-6) and/or 1 capsule of Golden Seal (#340-7). Close the container. Shake so the powders mix and go airborne. Open and sniff. Prepare for the mother of all sneezes and a clear head. Done. (You may want to do this outside, just sayin’). Polyps are growths that project inward towards a canal from a mucosal barrier. They occur also in the digestive tract and may signal an enzyme deficiency. Take Proactazyme Plus (#1525-0) 2 – 5X/day. Topically one can apply enzymes; either Proactazyme Plus (#1525-0) or Nature’s Fresh (#1549-7). These kinds of problems usually come from congested digestion. For now consider taking lots of Small Intestine Detox 6B, 6D and then follow the recommendations on the Digestion post for the types of problems you usually have, or, make an appointment.